long live the indie rebels !! may they always re-group . . . as legends !! this looks to be the work of JIM DRAIN, or FORCEFIELD . . in general ? apart from the now legendary Chicago-based, HAIRY WHO, active 1966-1969 . . . watch out for, among others. . . the FORCEFIELD crew, 1966-2003: MAT BRINKMAN, JIM DRAIN, LEIF GOLDBREG and ARA PETERSON – all well known to savvy art scenesters here in NYC, though maybe a little bit before your time – my newbie YALIES !! how time flies, and then: you are a l-e-g-e-n-d !! 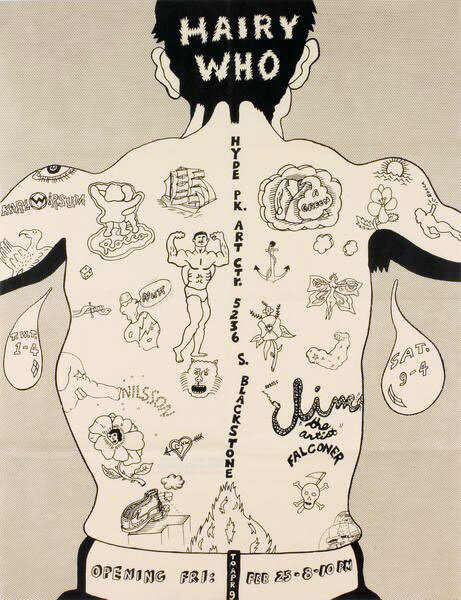 HAIRY WHO, HAIRY WHO poster, 1966.
offset lithograph, 28-3/4 x 22 in. looking back, seems to be a big part . . . of looking FORWARD, right now – and damn straight. yes, I’m thinking . . .
‘Under the Volcano: SIMON CERIGO, DAN ASHER, NANCY SMITH’.